We already saw the upcoming Galaxy Note 9 leak in blue, brown, and a little glimpse of the darkest version, but now the black model has appeared in its full side, frontal, and rear layout glory. The S Pen is refreshingly black here, as we were worried that the renewed focus on the stylus that gave it Bluetooth connectivity and its own battery, would do to the black model what it did to the blue one - equip it with am S Pen in contrasting color, but that's not the case here. 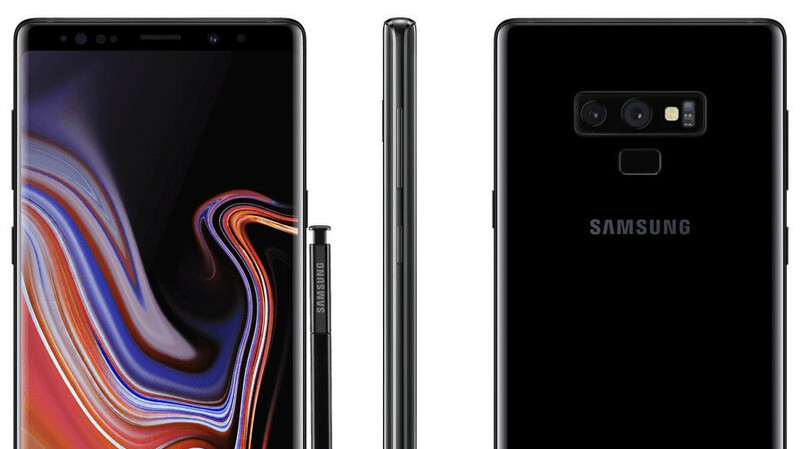 As a reminder, we are expecting a Note 9 (may be the last one in the series) with a 6.38" AMOLED display, 128GB basic storage, new dual camera set on the back, latest Exynos or Snapdragon top-end chipsets, and, above all, a 4000 mAh battery. Not too shabby, but, at a price hovering around the 1000 USD or EUR mark, it better not be. Nice but I like the Blue one better. Agreed. Black will be my choice only if blue isn't available in Canada. How do you tell it's not the Note 8 ? Oh, I see, it has a button placed a few mm lower than the Note 8. Also by owning it & knowing it's not the Note 8. I swear people complain about the stupidest $#¡t. Google enthusiasts complained about the 'incorrect' button placement, then everyone complained about removing the IR blaster, then about no longer having removable batteries, then the FPS being in the home button, then about it being next to the cameras, now about the (one time) the design is damn near identical to its predecessor. Who ever makes the perfect phone for you, just deal with them & that's it. The placement of last year's fingerprint reader was perfect. No one said that ever. Replacing batteries and no ir blaster were huge mistakes. how can you tell its not a iphone 6 to the 8? Oh look, here you are once again in a Samsung article. When people put things down as bad as you do it's, because they can't have one so they talk bad about it. Sorry Mommy won't get you one. Once again it's a beautiful phone and you know it. I like the look of it, new features with S Pen, if I had a complaint I guess it would have to be the camera cutout looks odd to me. The classic color of smart phones, but still remain the best accept for fingerprint you need to wipe the phone every minutes.